Becc Ország was awarded The Young and Emerging Artist Award of $5000 in the Hazelhurst Art on Paper Prize. Her winning entry ‘Rehearsal for all are equal and all may be crowned emperor’ plays with the phenomenon of non-existence, distraction and escapism. She looks at our inherent need to be lead and belong, and brings attention to our tendency to deflect responsibility and blur lines between reality and fantasy in an effort to bring meaning into life. 'Rehearsal for all are equal and all may be crowned emperor' - graphite and carbon pencil on layered paper. 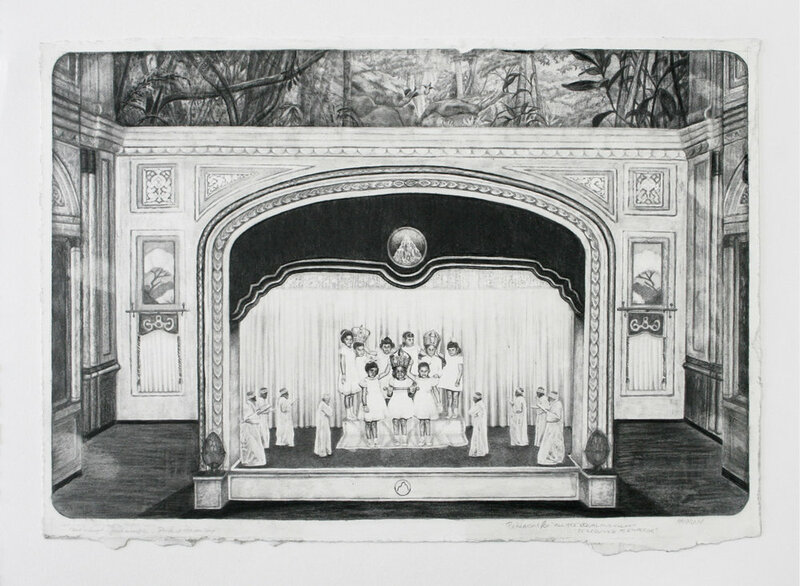 Becc Orszag's drawing 'Rehearsal for all are equal and all may be crowned emperor' is a finalist in the 2015 Hazelhurst Art on Paper Award. This years award attracted over 1500 entries by more than 750 artists. With prizes totalling $26 000 the biennial Hazelhurst Art Award showcases outstanding art created with, on or about paper. Artists compete for the $15 000 major award, the $5000 Emerging Artist Award, the $5000 Friend's of Hazelhurst Local Artist Award, and the $1000 People's Choice Award. The exhibition will present a diverse range of paper media and industry techniques, including drawing, printmaking, photography, sculpture, paper cuts and video. Exhibition of finalists work runs from 30 May - 26 July 2015 Hazelhurst Regional Gallery.